Merry Christmas Disney Mealers! So in honor of the holiday season, the next two weeks will be Christmas themed! Since this is out of the ordinary and I’ve been pressed for time with all the happenings around, I’m not going to make all the food shown in Mickey’s Once Upon a Christmas. I just chose two recipes that I feel would be good holiday treats. So put on your Santa-themed Mickey ears and lets get going! 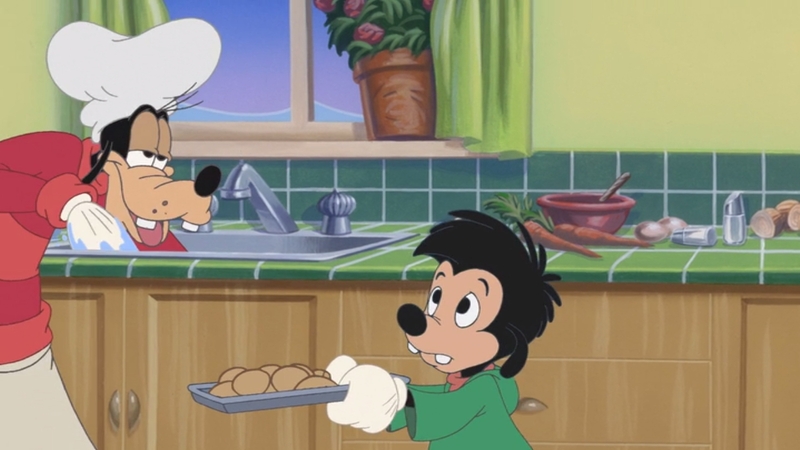 So the first recipe comes from the short with Goofy and Max. Goofy is trying to convince Max that Santa is real and they bake cookies. Microwave the butter for about 40 seconds to just barely melt it. It shouldn't be hot - but it should be almost entirely in liquid form. Using a stand mixer or electric beaters, beat the butter with the sugars until creamy. Add the vanilla and the egg; beat on low speed until just incorporated - 10-15 seconds or so (if you beat the egg for too long, the cookies will be stiff). Add the flour, baking soda, and salt. Mix until crumbles form. Use your hands to press the crumbles together into a dough. It should form one large ball that is easy to handle (right at the stage between "wet" dough and "dry" dough). Add the chocolate chips and incorporate with your hands. 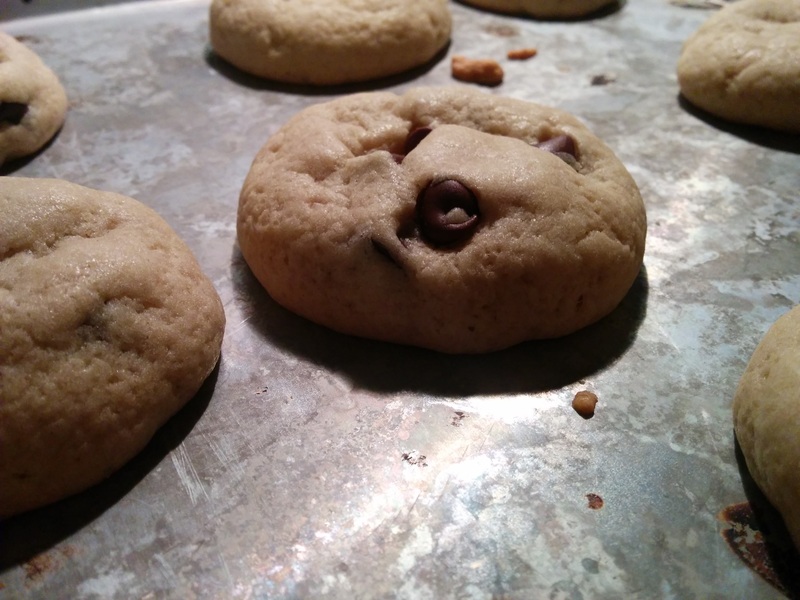 Roll the dough into 12 large balls (or 9 for HUGELY awesome cookies) and place on a cookie sheet. Bake for 9-11 minutes until the cookies look puffy and dry and just barely golden.Warning, friends: DO NOT OVERBAKE. This advice is probably written on every cookie recipe everywhere, but this is essential for keeping the cookies soft. Take them out even if they look like they're not done yet (see picture in the post). They'll be pale and puffy. This is from the last short. It takes the story of the Gift of the Magi and applies it to Mickey and Minnie. 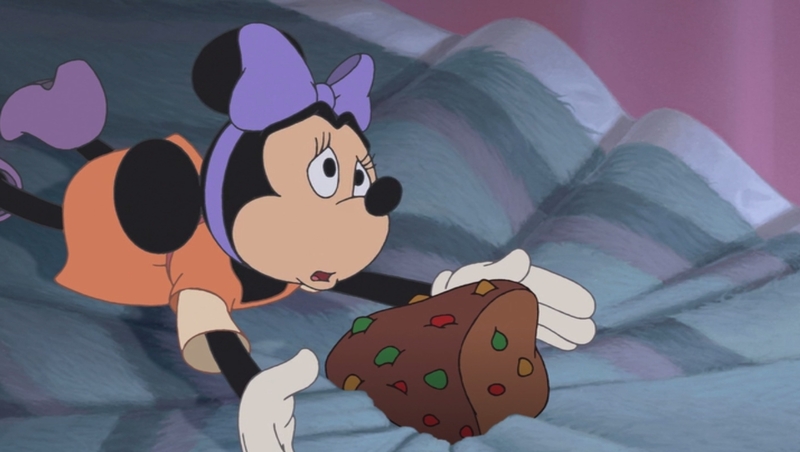 Minnie is excited to get a bonus for being the best worker at her job….only to find out that her bonus is a fruit cake. 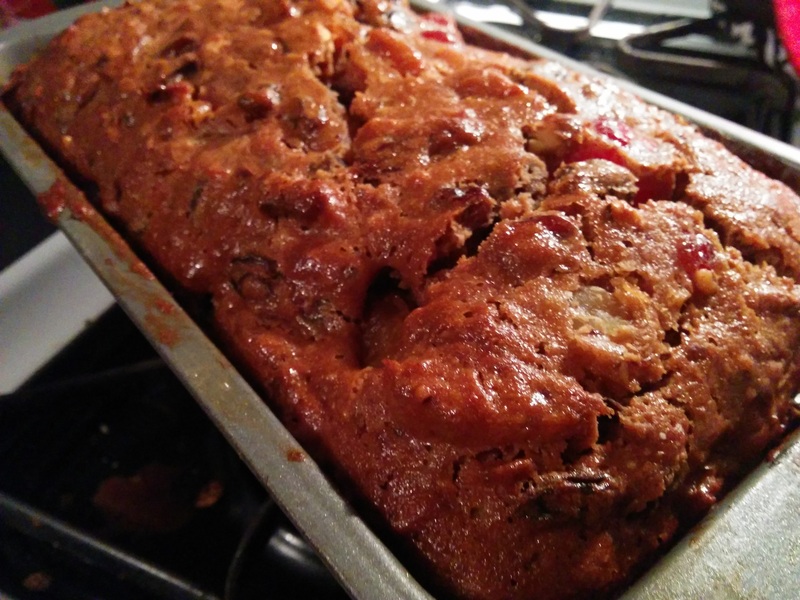 Well I tried to soften the blow with this amazing fruitcake recipe. Sure, its probably not good enough to buy a great harmonica case, it’s still pretty great. Combine dried fruits, maraschino cherries and both zests. Add rum and macerate overnight, or microwave for 5 minutes to re-hydrate fruit. When cake is completely cooled, seal in a tight sealing, food safe container. Will it Wish you a Merry Christmas? So both recipes are very Christmas worthy. The cookies are great, especially with milk and the fruitcake is scrumptious. Make sure to make them yourself and spread some Holiday Cheer!